As a steady flow of visitors slowly made their way through the United States Holocaust Memorial Museum on a recent morning, some contemplated a special exhibition on the Khmer Rouge terror in Cambodia, which wiped out almost a fifth of the population. Helen Wedgewood, an American tourist, was among those in the museum. After she studied the images and watched a short documentary film, she could not hold back her tears. “I feel very sad that this happened. I can’t imagine that when it was happening nobody knew, and if people knew, that they didn’t care enough to intervene,” the nurse from Apache Junction, Arizona, said. Wedgewood and Nguyen are two of the roughly 1.2 million visitors who will have seen the exhibition “Cambodia: 1975-1979” and a linked exhibition, “I Want Justice!” since they opened in May 2015, according to the museum. The exhibitions’ websites have been viewed online more than 200,000 times by about 82,000 visitors, officials said. Cameron Hudson, the director of the museum’s Simon Skjodt Center for the Prevention of Genocide, said the Cambodia exhibitions are helping to inform people that genocide and mass murder occurred throughout the world in the 20th century and could happen again unless actively prevented. “For many Americans who visit the museum, it is the basic lesson of what happened in Cambodia,” Hudson told VOA. “But most importantly, it delivers a deeper message that genocide did not end with the Holocaust; that the Holocaust was not the only genocide to happen and that we continue to repeat the mistakes of the past. “Part of our museum’s goal is to highlight … the feeling that governments should prevent and respond,” Hudson added. FILE - Tourists view portraits of victims executed by the Khmer Rouge regime at the Tuol Sleng Genocide Museum, formerly a notorious Khmer Rouge prison, in Phnom Penh, Cambodia, April 9, 2015. 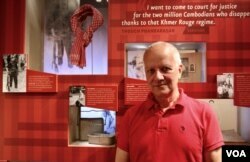 Greg Naranjo, the museum’s special exhibition developer and curator of the Cambodia display, agreed that Khmer Rouge-era killings offered an important lesson for Americans and other museum visitors. “Knowledge and awareness is the first and most important thing that we can contribute for the prevention of genocide in general,” he said. Cambodian Americans who visited the exhibitions said they were glad to see a large audience learning their country’s history. “It’s a reminder in a good way, for both Cambodians and everyone in the world,” said Ben Bao, a 66-year-old Khmer Rouge survivor who is president of Cambodian Community Day, a cultural, educational and social organization in the Washington metropolitan area. 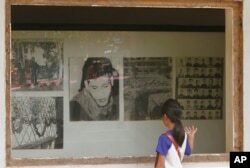 FILE - A Cambodian girl looks at images of Khmer Rouge victims displaying at Tuol Sleng genocide museum, formerly the regime's notorious S-21 prison in Phnom Penh, Cambodia, March 26, 2015. “Cambodia: 1975-1979” examines the bloodthirsty tactics the Maoist Khmer Rouge forces of Pol Pot used to establish their new state, Democratic Kampuchea, which they envisioned as a self-sustaining, farm-based society. Soon after the Khmer Rouge took Phnom Penh on April 17, 1975, they forced its 2 million residents into the countryside, where they joined millions of others pressed into forced-labor brigades, building earthworks and rice paddies. The Chinese-backed regime ran dozens of interrogation centers where tens of thousands of people were tortured and killed, often for no clear reason. About 1.7 million Cambodians are estimated to have died from disease, starvation, exhaustion and murder. Historians continue to struggle to establish a more exact toll — in Cambodia, every family has a story of loved ones who were killed or went missing. 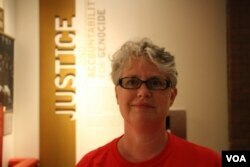 The exhibit “I want Justice!” examines the efforts to bring the perpetrators to trial. 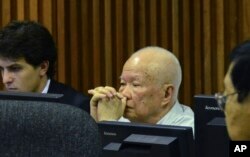 It focuses in large part on attempts in Cambodia to prosecute aging Khmer Rouge leaders at the United Nations-backed tribunal in Phnom Penh, the capital city. It focuses on how survivors have sought justice, be it personal, cultural or historical. 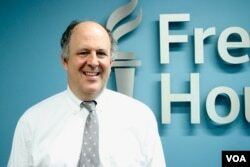 Michael Abramowitz, director until earlier this year of the U.S. Holocaust Memorial Museum’s Levine Institute for Holocaust Education, was a key force behind the Cambodia exhibitions. Abramowitz, the current president of Freedom House, said it was important to have a museum display on the Khmer Rouge horrors. “In terms of the pure numbers, in terms of the percentage of the population, it is really one of the most terrible cases of state-sponsored killings in the 20th century,” he told VOA. FILE - Youk Chhang, director of the Documentation Center of Cambodia (DC-Cam), poses after an interview with Reuters in Phnom Penh April 17, 2015. Youk Chhang, the director of the Documentation Center Cambodia (DC-Cam) in Phnom Penh, which provided most of the material for the exhibitions, praised Abramowitz’s efforts, adding that former U.S. Ambassador to Cambodia Joseph Mussomeli had also played an important role. “Without [them], I do not think the exhibitions would have taken place,” Chhang told VOA. Mussomeli said he had supported the exhibition because it would educate the U.S. public, adding that Cambodians also benefited from such exhibits and other educational initiatives abroad or at home. To that end, the United States Agency for International Development (USAID) has been supporting DC-Cam. Since 2004, when an endowment was established for the center, USAID has donated almost $10 million. In April, USAID provided the latest round of funding, $5.8 million, to anchor the endowment, which will sustain DC-Cam for about another 20 years, Chhang said. The center was founded in 1995 with a mission to research and collect documents on the Khmer Rouge era. 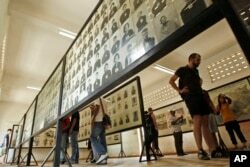 Museums, schools and other institutions have used its findings, as has the U.N. tribunal. Chhang said DC-Cam’s main mission was to educate Cambodians and foster understanding and discussions of the horrors, part of a healing process for the country. One of the most important activities, Chhang said, is developing a high school curriculum. “All the students who studied about genocide know well about the genocide and have the ability to protect human rights and to prevent it from happening again,” he said, adding that survivors should also educate their children. Khieu Samphan, center, former Khmer Rouge head of state, sits in a court room of the U.N.-backed war crimes tribunal, in Phnom Penh, Jan. 8, 2015. The U.S. has been a strong supporter of the Khmer Rouge Tribunal, even though there are allegations that the U.S. did little to stop the Khmer Rouge regime when it was in power. The U.S. and other Western countries agreed to let the Khmer Rouge fill Cambodia’s seat at the United Nations in order to punish Vietnam, an ally of the Soviet Union, for invading and toppling the regime.